Printable Black & White PDF Printable Color PDF More Paper Dolls & ClothesOriginally, I was going to start the guys series with jeans, but after I thought about it, I decided the jeans were too boring. Realistic? Oh yeah, but… not exactly pulpy fantasy armor or an elegant fantasy gown. So, I moved the jeans to Friday and instead decided to open up with these post-apocalyptic outfits. Plus a reader commented on my Facebook page about how excited she was for more post-apocalyptic clothing. See? I do actually listen to people. Anyway, I spent most of Christmas time with my parents in the Southwest. I also spent most of that trip working on paper dolls for this month like mad woman. So, the colors of this post-apocalyptic clothing really reflect the colors of the desert. The thing about the desert is that at first glance it just looks brown. When you really watch how the color changes when the light changes, you realize there’s a whole depth of ochre, hazy purple and soft mossy teal there. Suddenly, the desert doesn’t look brown anymore than a forest is just green. It is one of the things I love about the desert. It is also the same color scheme that I used for this Sprite’s paper doll set of apocalyptic clothing. I had planned on developing a new color scheme, but I rapidly realized that my “new” color scheme was almost identical to this older color scheme, so I decided to borrow it instead. Lazy? I prefer to think of it as time management. Design wise, I drew inspiration from this set of armor and this pair of pants. Both pieces come from my Post-Apocalyptic Fashion Pinterest board. I haven’t done it yet, but I think I really need to design something that used this amazing leather arm piece. I’m kinda in love with it. 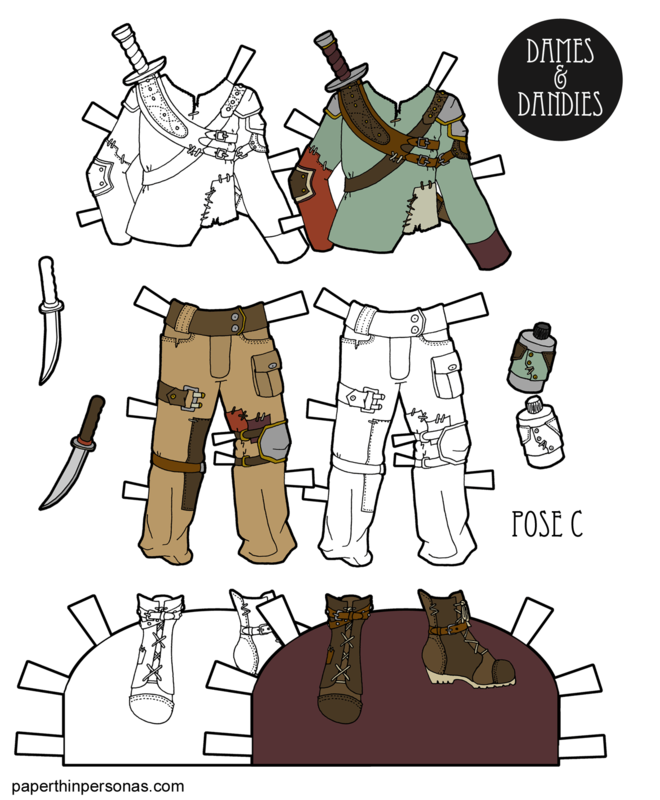 If you’re thinking “Man, I need more post-apocalyptic fashion paper dolls in my life” than I have a whole post-apocalyptic tag for you to enjoy. Either way, tell me what you think of today’s paper doll in a comment, if you have a chance. Always love to hear from you all. Like this very much. I grew up in Arizona, and can say that your colors are perfect. I loved salmon too (an apartment complex near us was painted salmon and Dad used to say it hurt his eyes on the commute home), but I don’t see that as post-apocalyptic. Yeah, salmon pink is not a color I associate with the end of the world. 🙂 I do love the colors of some of the buildings in Arizona, but I don’t know if I would want a salmon pink house. This set is super rad. I also really adored the impractical warrior womens set of armor you did earlier. I didn’t get a chance to comment on it this week but was definitely loving it! I love this color scheme. This makes me think Dandy guy is team mates with the Sprites in some kind of post apocalyptic video game type world, where the teams are all matchy matchy. On a desert map.